iPodRobot.com has developed iBackupBot for iTunes which allows the user to manage backup for iPad, iPod Touch and iPhone. It helps in data and information recovering inside them from the computer. 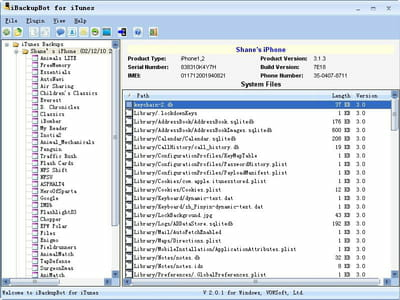 Browsing: The program offers the possibility to browse through the backup files. Some files might have been critical while the user did the backup process on the devices, but with this browsing,finding what one needs is easier. Export: iBackupBot for iTunes also enables data sharing with others thanks to the export function. Whether it is sms messages, notes or contacts, the user has just to click on the Export button it is done. It can export text and Excel files. Removing: This utilitarian also enables the user to remove certain data from the devices. He can for instance remove a single call history record from them or the recent email address if he needs to do so. 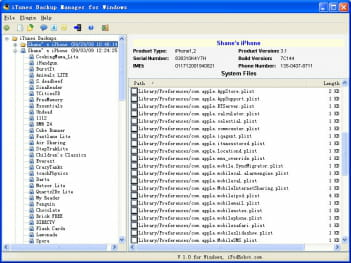 The program has also the capability to maintain multiple backup for the iPad, iPod Touch or iPhone. It offers the possibility to edit data as well. This is a shareware version of iBackupBot for iTunes. Latest update on July 1, 2015 at 07:55 AM.